While they’ve all but disappeared from the market nowadays, there was a time when goofy made up vehicles were the norm for action figure lines. Kenner in particular was pretty big on them, especially ones that they made up. Yesterday, I looked at one of the figures from their Superman: Man of Steel line, and you might think that someone like Superman wouldn’t have any need for vehicles, but you’d be wrong. 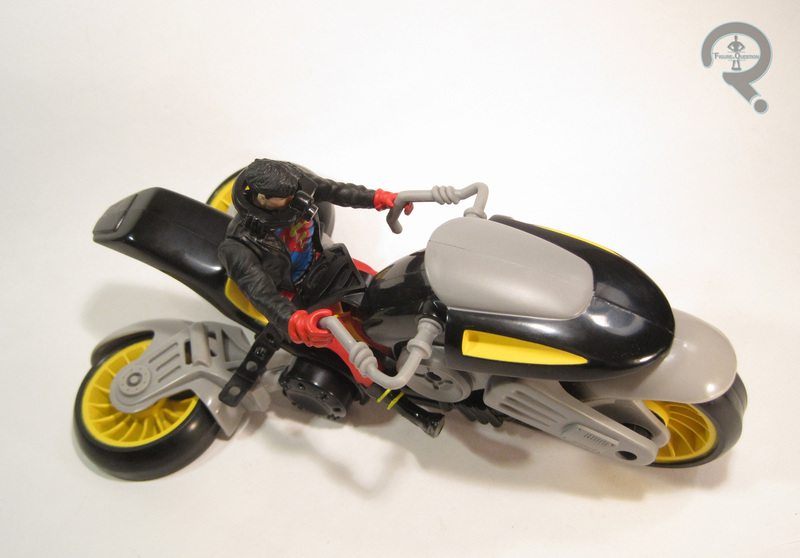 The Man of Steel line had three different vehicles, including today’s focus, the Superboy “VTOL” Cycle. The VTOL Cycle was released as the first (and smallest) vehicle in the Superman: Man of Steel line. The cycle is about 3 ½ inches in height and 9 inches in length. It’s not based on any design from the comics, since Superboy’s never been one to need flying transportation, so it’s a totally original creation from Kenner. Despite re-use of vehicle molds being somewhat common from Kenner in th 90s, the VTOL Cycle has its own mold. 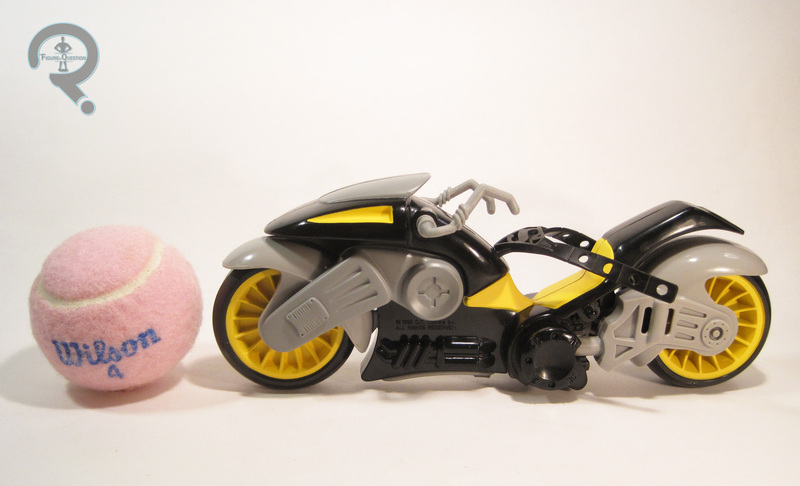 Generally speaking, it’s really just a fairly generic pseudo-Sci-fi motorcycle. There aren’t any super in depth details, and the sculpt is slightly on the soft side, but it certainly doesn’t look out of place with the rest of the line. The vehicle has been designed with the Superboy figure in mind, so it fits him pretty well (if not perfectly). There’s a seatbelt piece with a cool Superman logo at the front, which keeps him properly seated. The cycle boasts that it “converts to pursuit jump jet” on the front of the box; essentially, the back wheel splits in two and each half can be folded out to create a turbine on either side. It’s nothing extraordinary, but it’s vaguely cool. There’s also a “kickstand” piece, which is useful for keeping the vehicle standing. 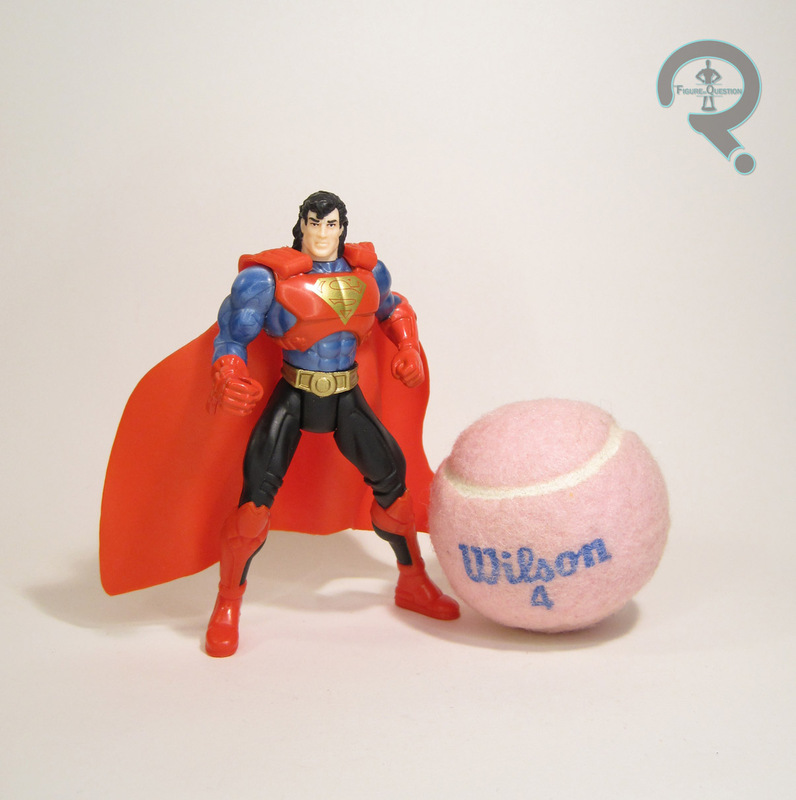 The Cycle is done up in colors that vaguely match up with Superboy, but are not so specific so as to prevent the cycle from being used with another figure. The paint has a few spots of bleed over here and there, but generally looks fairly decent. There was also an included Superman logo decal, meant to be placed on the front of the Cycle, but I actually forgot to put it in place. 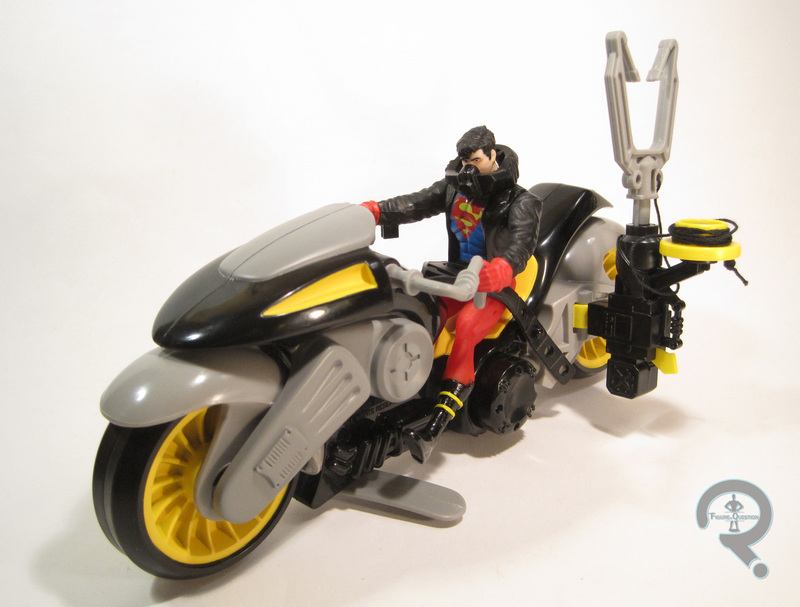 The VTOL Cycle includes a “claw snare” launcher, which can be mounted on either side of the back wheel, as well as an oxygen mask piece, which is meant to be used with the Superboy figure. As I noted in yesterday’s Superboy review, I got the VTOL Cycle in a lot with the Superboy figure from a vender at this past Farpoint. I never had this vehicle growing up, but I saw it on the back of various different packages over the years, so I was always curious. Truth be told, it’s not the most thrilling vehicle Kenner ever put out, but it’s nifty enough that the purchase feels warranted. Plus, it makes a pretty neat accent piece for the Superboy figure (of which I now have two)! 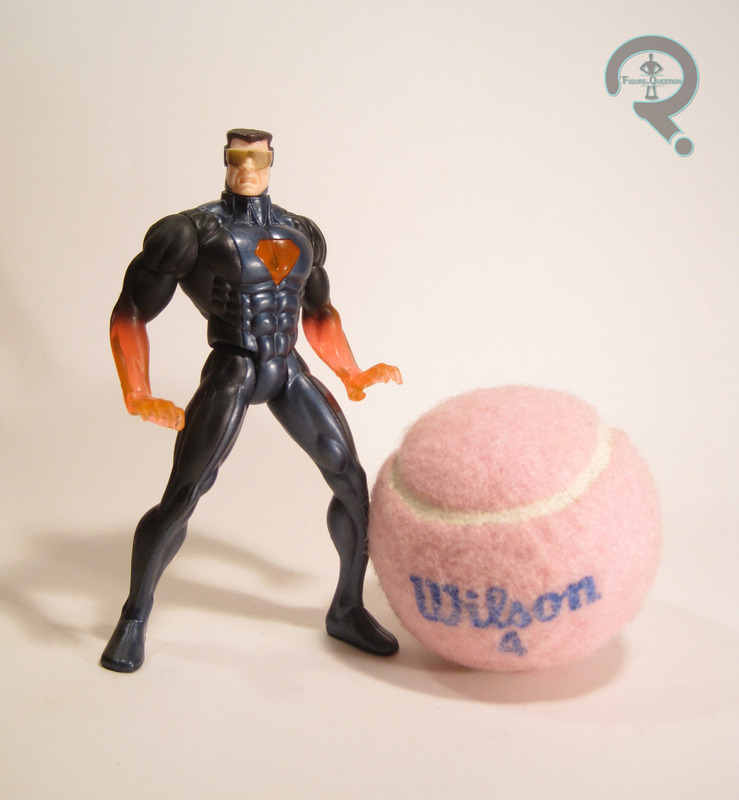 In the 90s, Toy Biz had a ton of success with their litany of Marvel Comics-based action figures. 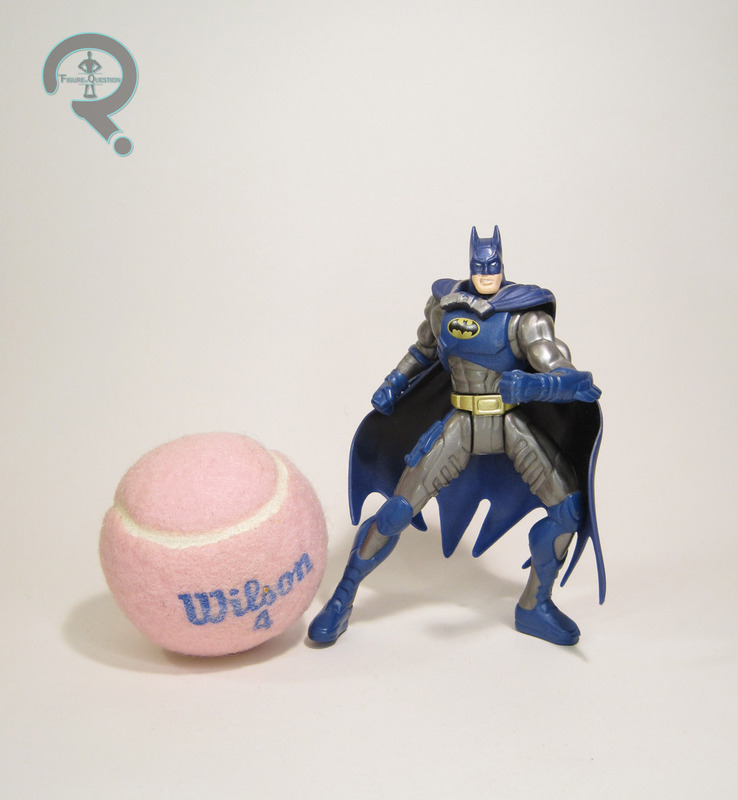 Kenner, the then holders of the DC license wanted in on some of that success, and branched outside of their “safe zone” of movie and TV-based figures, to try something with a more direct comics tie. 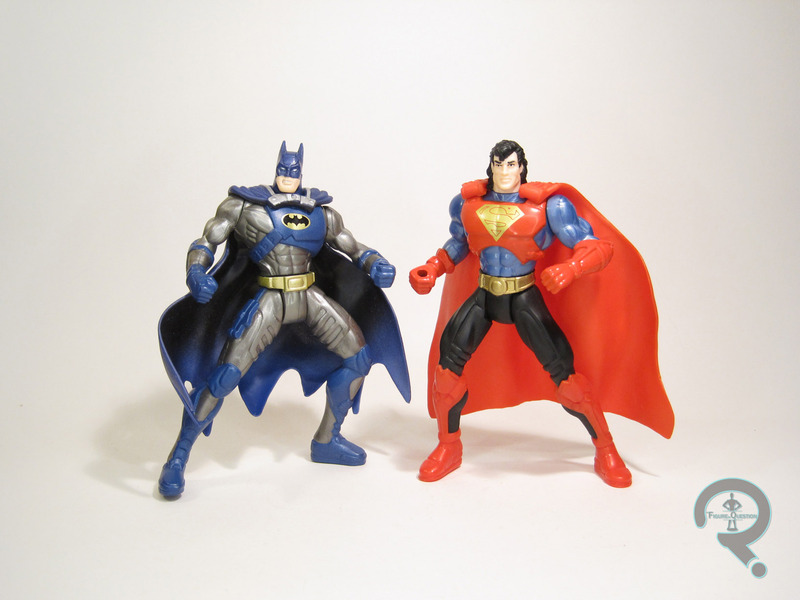 There was, of course, a rather extensive Batman line, but they also produced a short-lived line of Superman figures, under the title Superman: Man of Steel. 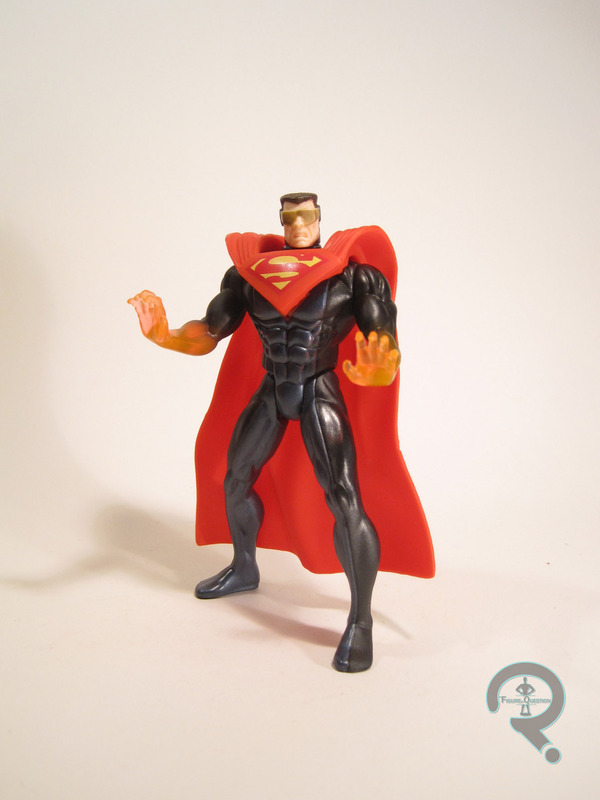 The figures were mostly based on characters from the Death of Superman and Reign of the Supermen storylines, including the uber 90s incarnation of Superboy, who I’ll be looking at today. 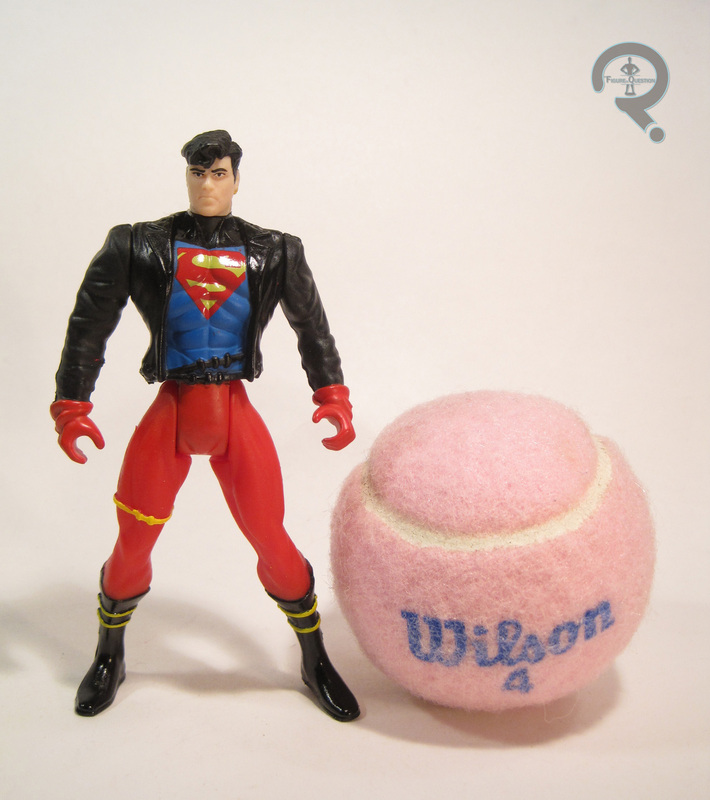 Superboy was released as part of the first series of the Superman: Man of Steel line, as one of the three non-Superman figures in the set. The figure stands about 4 ¾ inches tall and has the standard 5 points of articulation for a Kenner figure. 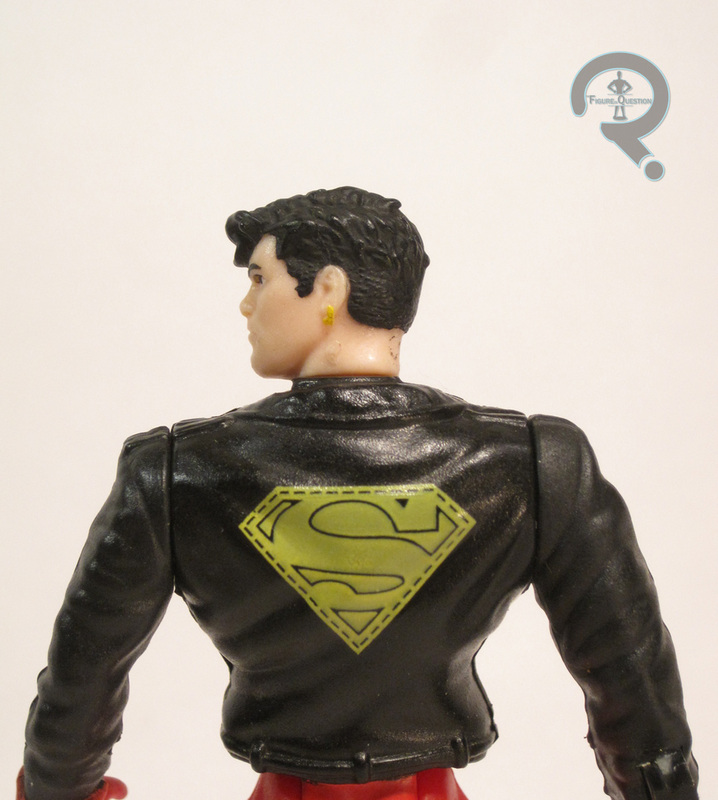 Superboy is based on his 90s, leather jacket sporting look. As dated and silly looking as it is, it’s really his signature look, and the only one he had at the time. He got a totally unique sculpt, which is actually pretty cool looking. The proportions are mostly pretty sound (if a bit exaggerated; hey, it was the 90s), and the detail work, especially on the jacket is incredibly well handled. I also love the head sculpt, especially the attitude present in the facial expression. There are a few odd bits, though. For one, the hand poses are pretty stilted, and he’s also got a weird blockish thing sticking out of the back of his right forearm, which is sort of odd. Superboy’s paint is pretty straight forward, but it has some pretty cool things going on. The colors are all pretty vibrant (though the yellow on the chest could stand to be a bit brighter) and there’s some pretty neat details, like the cool stitched logo on the back of the jacket. 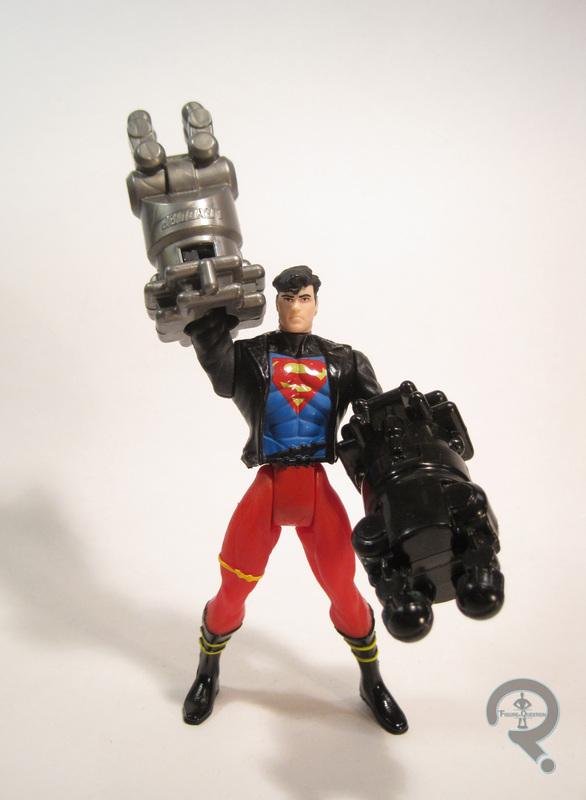 Superboy was packed with a two spring-loaded Mammoth Capture Claw and Taser missiles. They slip over his hands, and are the reason for the block thing on his forearm. They’re definitely a weird thing to included, but hey, it was the 90s. Might as well include a projectile of some sort. I actually own two of this particular figure. The first was bought for me by my grandmother, from a K-Mart I believe. I remember really wanting a Superboy figure (I was a huge fan of the Filmation Superboy show as a kid) and deliberately setting out to get him. I don’t think I had quite picked up on him being separate from the Clark Kent version of the character at the time. He remained one of my favorite figures growing up, and took quite a beating. At this past Farpoint, I found another Superboy, in a lot with the Superboy VTOL Cycle, at the table of the same vendor who sold me the Power Loader, and figured having a spare wouldn’t be the worst thing ever. I’m actually really happy about how well the figure has aged.